Yes, there are a lot of power tools out there, and with so many brand names and models, coming to a final purchasing decision can be extremely hard. Something which every home handyman, carpenter, and everything in between needs, is a good drill and driver. This is a tool that you will end up using on a daily basis, and it’s one of the most commonly used out there. Today we are here to review a 2-in-1 cordless drill and driver combination that is quite popular. So, let’s get to it and see what this particular product has to offer you. 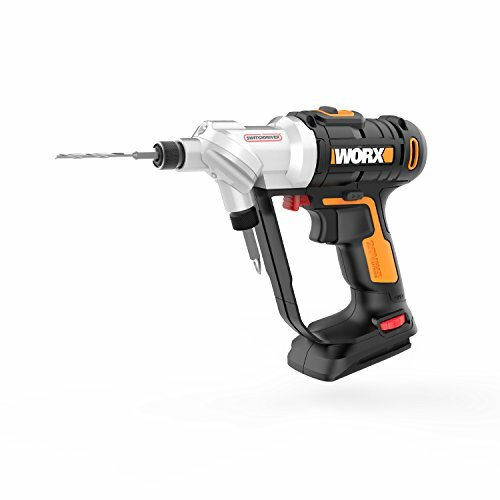 The WORX WX176L.9 2-in-1 Cordless Drill is a very affordable drill and driver combination. It has a unique design which has rarely been seen before, one which can help make life quite a bit easier, and make your jobs faster to complete as well. The WORX WX176L.9 2-in-1 Cordless Drill is a good tool for a lot of people. Like we said, it is both a drill and a driver. 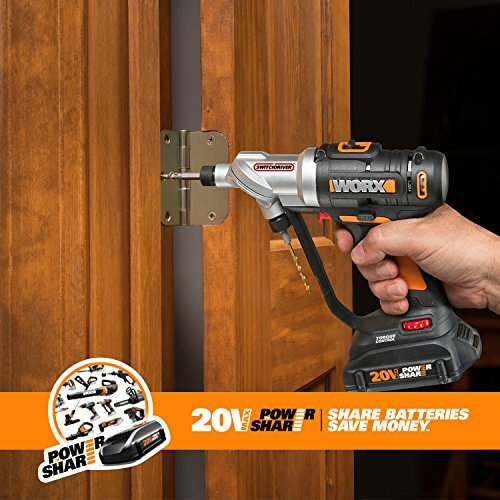 For one, due to the battery share program which WORX has, you can use the battery which comes with this drill driver for all compatible WORX tools. It’s pretty cool indeed. When it comes down to it, anybody who needs a drill and driver would do well with the WORX WX176L.9 2-in-1 Cordless Drill. When you purchase the WORX WX176L.9 2-in-1 Cordless Drill, you get a tool that has separate and rotating chucks for the drill bits and driver bits. This is a 20V rechargeable battery-powered tool, and you can choose to buy it with or without the battery and charger. The WORX WX176L.9 2-in-1 Cordless Drill is a really neat 2-in-1 driver and drill to keep in mind, so let’s talk about its main features. First and foremost, what is really neat about this item is that it does not use the same chuck for the drill bits and the screwdriver bits. Instead of having to change bits, you can simply press a button to rotate the chuck head. There are two chucks here, one for drilling and one for driving. This means that you can effortlessly switch from one task to the other with the push of a button. Now, having 2 chucks does make the WORX WX176L.9 2-in-1 Cordless Drill a bit bulkier than your average drill and driver, but it works fine as long as the space you are working in is not too tight. Next, the WORX WX176L.9 2-in-1 Cordless Drill comes with chucks that are very easy to load and unload. The chuck head features a screw-shut function, so you can simply loosen the chuck with a twist to remove bits, put in a new bit, and then tighten it back up. It really does not get any easier than that. Keep in mind that this item is specifically designed to be used with hex-shaped bits, not rounded ones. Something else which you might appreciate about this drill driver combo is that it comes with a very bright LED light to illuminate whatever you are working on, just so you do not have to work in the dark. Furthermore, one of the coolest parts about the WORX WX176L.9 2-in-1 Cordless Drill is that it comes with a battery that is part of the battery-share program. This means that you can use the compatible WORX battery with this tool, and with all other WORX tools that use the same battery. Keep in mind that you can buy the WORX WX176L.9 2-in-1 Cordless Drill with or without the battery and charger, because you might already have the required battery which came with another WORX tool. The battery life is not the very best, but it also does not take very long to charge, so it’s not too bad of a trade-off. The WORX WX176L.9 2-in-1 Cordless Drill comes with a precise drill and drive torque-control feature. This is a dial located on the bottom which you can use to precisely adjust the torque so you never strip screws or over-drill when creating a hole. You might also like how this particular tool comes with a 2-speed function, so you can turn the speed up or down depending on your needs and the materials you are working with. Finally, the WORX WX176L.9 2-in-1 Cordless Drill is a bit bulky for what it is, so it is not the best for tight spaces, but on the other hand, it weighs no more than 3 pounds, so it should be more than light enough to use with a single hand. The WORX WX176L.9 2-in-1 Cordless Drill is actually a very easy tool to use. It may not have all that many unique features besides the double chuck, but it’s a fine drill and driver none the less. For a better idea on how to use this item and what it can do for you, take a look at the video which we have included here. In case you are not a big fan of the WORX WX176L.9 2-in-1 Cordless Drill, we would recommend looking at the Hi-Spec 20V Cordless Power Drill. The main benefit here is that it comes with a hard case, the battery and charger, the drill, driver, and other useful bits. When all is said and done, we think that the WORX WX176L.9 2-in-1 Cordless Drill is a very good tool. It has a very unique double-chuck design so you don’t always have to switch out drill for driver bits. It also has a shared battery that works with other compatible WORX cordless tools, it is lightweight, and still manages to have a good deal of power behind it.